Days before their deleterious attacks, Islamists carefully marked any Christian stores with a black X and any Muslim ones with a red X. Unsurprisingly, it is the ones with the red X that are still standing. The results of these savage attacks were widespread, Churches all the way from Alexandria to Upper Egypt were burned, substantiation that these were carefully planned attacks by the Muslim Brotherhood. In El-Nazla, Christian neighbours recalled how the Islamists broke down the gate to the church, screaming ‘Allah Akbar’ and crying out the Muslim Brotherhood slogan that ‘Islam is the solution’. Sami Awad, a resident, said that “first they stole the valuable things and then they torched the place, whatever they couldn’t carry, they burned”. In Upper Egypt, a Muslim Brotherhood crowd attacked the al-Amir Tadros Coptic Church, they broke in, set the Church on fire and stood around it carrying Molotov cocktails and assault rifles. They then proceeded to attack and burn around three other churches, 20 Christian shops, 2 Christian schools, a Christian orphanage and a community centre. Police and security forces were absent for the duration of these attacks despite desperate calls for help from the community. At Mar Meena Coptic Church in Minia, a large crowd attacked the Church, Church clinic and services building. The security forces and police, again were absent. In Sohag, south of Egypt, a group of around 150 men marched towards St George Coptic Church chanting “Islamic, Islamic” (a common chant by those supporters of a purely Islamic state), before looting the Church and setting it on fire. It is also worth noting that in Egypt, Christians face many legal restrictions on the right to build and maintain Churches, regulations that Muslims don’t face. These restrictions are put in despite Coptic Christians being indigenous natives of Egypt, predating the arrival of Islam to Egypt by around six centuries. 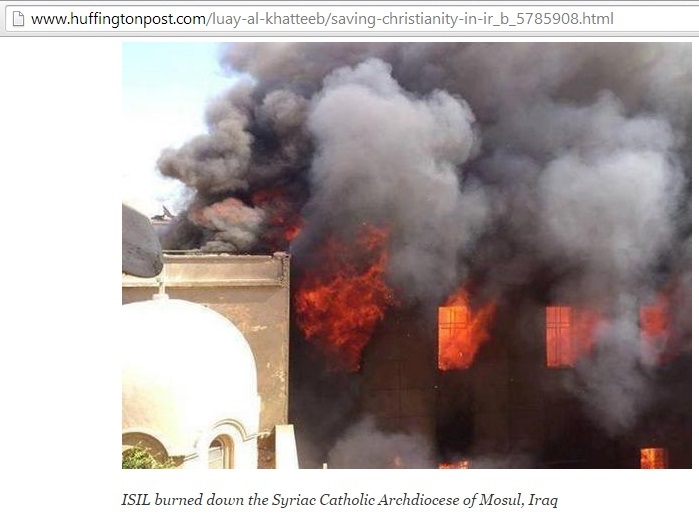 In Beni Suef, a Franciscan girl’s school and Church was attacked and burned. Nuns who were alone at the school frantically called the Priest, Father Boulos Fahmy, informing him that the school was being threatened. The mob that attacked the Church then forcefully took the nuns and paraded them through the nearby streets, encouraging verbal abuse towards them. In Dalga, a Christian resident recalled how a group of men forced their way into his house, shot his cousin twice (eventually killing him), the resident managed to climb to the roof, along with his mother, daughter-in-law and cousin’s wife where they were met with birdshots being fired from the mob below. At St Mary and Priest Ibram Monastery in Delga, the Sunday service was forced to be cancelled after Muslim Brotherhood supporters destroyed the monastery. This was the first time a service has been cancelled in this monastery in 1600 years. Other events included the shooting of a 10 year old girl as she left the Church, a Christian taxi driver who was killed for accidentally straying into a protest by Morsi supporters in Alexandria and the shooting of another man who was shot to death in Sohag. These examples are just a miniscule snapshot of the events that occurred on the 14th August, these savage attacks were seen all over Egypt, which begs the question, where was the Western media in reporting these deadly attacks? The inexcusable delay by Western media to cover these attacks is truly shocking, in no other situation has such widespread attacks on a minority been brushed aside by the media.